There are many different kinds of lighting systems to choose from when you want to illuminate your water feature. The lights you choose should be highly durable and safe from moisture and water exposure since they’ll be going in or near ponds, waterfalls, or other water features. Having the right kind of lighting for your water features helps ensure that you have a system that will last for years while providing a safe source of lighting. The style of lights you choose can also affect your water feature’s appearance. You might want decorative lighting that adds visual appeal, or you might prefer to have subtle lights that won’t draw the eye away from your water feature. Getting professional advice from outdoor lighting experts is the best way to make sure that you choose the right lighting system for your water feature. Having lights aimed at your water features isn’t enough to properly draw attention to them. Outdoor lighting for these features requires careful planning in terms of positioning. To provide waterfalls, ponds and other water features with the most effective outdoor lighting, you need to have lights pointed in the right direction and installed at the right angles; otherwise, outdoor lights can create too much glare or not provide enough lighting. Lighting for water features should be strategically placed. For example, you can have lights placed near cascades and along the sides of large waterfall features. For a smaller fountain, position lights so that they provide illumination for the whole feature without being too harsh. Underwater lights are another option for showing off water features. However, these lights aren’t always the right choice. You can use underwater lighting if your water features are filled with clear water, but you should avoid them if you have water with a murky appearance. Putting underwater lights in water that isn’t clear results in poor lighting that won’t flatter or enhance your water features. When you have underwater lights installed, you also have to be careful about how it’s done. 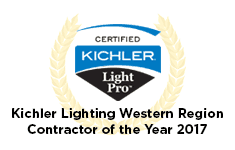 Improper installation can result in wiring problems if the wires inside these lights get wet. Make sure that you have these lights professionally installed using equipment that isn’t vulnerable to water exposure. Arranging lights in specific locations can create visually interesting effects that add even more beauty to your property. Some combinations of underwater lights and lights outside the water can give the water feature an extra special appeal. You can also have outdoor lighting set up to create a more subtle visual effect that creates a calm and soothing environment. No matter how you decide to light your water features, you should plan on having them maintained on a regular basis. This type of maintenance can catch potential problems with your outdoor lighting early before they turn into more expensive problems. Routine maintenance also helps ensure that your outdoor lighting remains in safe and proper working condition. How often you’ll need maintenance for water feature lighting depends on the kind of lighting system you have, the water features you have, and the bulbs you’re using. Underwater lights will require more frequent maintenance than lights that are outside the water. LED lighting systems typically need less maintenance than other types of outdoor lighting bulbs. If you have outdoor water features, enhance them with the right lighting. 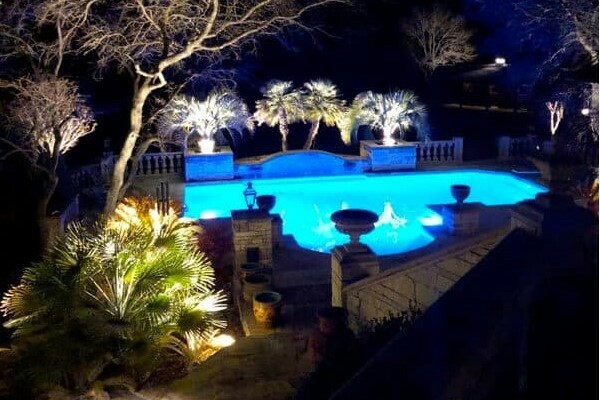 Contact Enhanced Outdoor Lighting and Design to discuss water feature lighting for your home in the San Antonio or Austin area.